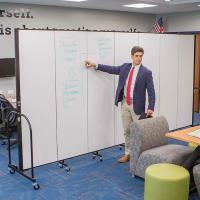 Constructed from a series of 22-inch wide hinged panels, each Freestanding Screenflex room partition is a rolling, space-dividing, sound-absorbing machine. 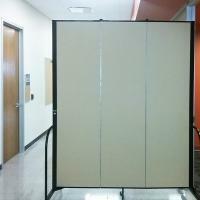 Our custom room dividers open and close in accordion style, and our short or tall room dividers also can be set up in a number of shapes. 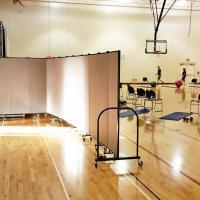 Screenflex portable walls are available in six heights and six lengths, giving you 36 different room divider sizes and choices. 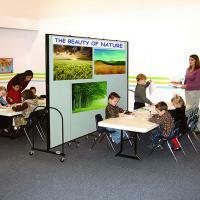 Room divider heights range from 4 feet to our 8 feet tall room dividers. 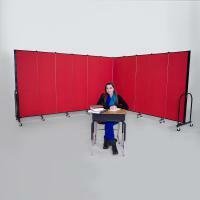 Room divider lengths range from 5 feet 9 inches to 24 feet 1 inch.